First international forum between fashion and technology, Decoded Fashion will present its next edition in Milan co-organized by Pitti Immagine's 'FieraDigitale' (Digital Fair aka e-Pitti) in partnership with Tecnamedia, the New York-based company that has produced the previous London and New York editions of this forum. Showcasing special projects and hosting leaders in the industry in order to promote an encounter between fashion & retail, Decoded Fashion is a platform of innovation that reunites new startups and established companies from all over the world. 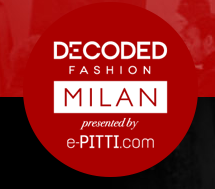 Decoded Fashion will take place at La Pelota, Milan on October the 16th, 2013. Limited seat availability, reserve yours HERE.